CROSS fire claimed at least two victims when three teams consisting of soldiers, police officers and Ministry of Environment and Tourism officials on the back of a bakkie opened fire on charging lion that earlier injured a member of the public. According to Oshana police Spokesperson Warrant Officer Shikole, three soldiers, three police officers, two MET officials and the 29-year-old cattle herder, Festus Fredericks, went in search of a lion at Uulunga wa kolondo cattle post in the area of Ondangwa on Friday morning. The lion reportedly attacked and injured a member of the public earlier the same day. “They were all on the back of a Toyota Land Cruiser that belongs to the environment ministry. Frederick was giving directions as to where the lion was spotted. Upon finding it, the animal charged at the vehicle in an aggressive manner and almost climbed into it, which prompted the different officials, officers and soldiers to shoot at it. In the process the 51-year-old Amalia Sheya, an MET official and the cattle herder, Fredericks were wounded,” Shikole said. Sheya was injured on her right jaw and is currently admitted at the Oshakati State Hospital. Fredericks was shot in the left shoulder and was also admitted to the same hospital. 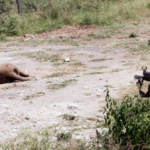 The officials on the back of the bakkie did however manage to kill the attacking lion. According Warrant Officer Shikole a case of attempted murder was opened and investigations into the shambolic set of events have already started.